Now, this is something that I wouldn't like to receive from my producer or actually from anybody else! 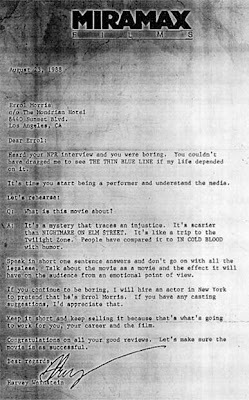 It seems to me that Weinstein and Errol Morris had difficulties promoting their films in 1988 "The Thin Blue Line" because Morris was such a bad PR! And this letter is Weinstein's reaction to Morris! barbaros yerine cast etmemi istediğin biri varsa söyle edeyim abi. beni uğraştırma:) süpermiş bu. bu arada filmi izledim. son zamanlarda izlediğim en etkileyici film olabilir. kaçırma!